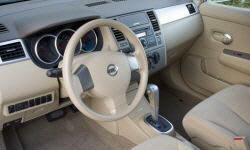 Nissan Versa Ride Smoothness Pros and Cons | Page 1 of 1 | Why Not This Car? Compared to other cars in this class I test drove, the ride was way above and beyond. Smooth with just enough feel that I know what's going on with the road beneath me. I felt every bump in the road, I realize this is not a top of the line Sedan, but it is a Sedan. I still feel the road in my Yaris, but not like the Versa. When driving down washboarded sections of road, you get a feeling of "milkshake brain"
The shock and suspension system feels sturdy yet effective in removing the bumps you normally feel inside the vehicle. The larger rims and full side tires assist in that. Much smoother that the average car of that size. This car drives like a midsize car instead of a subcompact car. The rides nicely on the highway and is comfortable. Smooth ride that isolates from most bumps, but not floaty. I find the Versa to be too choppy over small bumps. I have driven small cars for years. 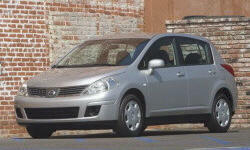 The Versa rides worse than most others. Soaks up bumps nicely without feeling like a boat.